This Friday I will be venturing south of the border with a friend of mine to the great Walden Galleria in the city of Buffalo, New York, where there is a lovely Macy's department store. Living in Canada, and therefore being deprived of some pretty fantastic US stores, including Macy's, this is a big treat. I really don't know why we don't have Macy's in Canada. I'm sure it has something to do with NAFTA and the competition bureau, but so be it. We Canadians will make the trip - especially with our dollar doing as well as it is. 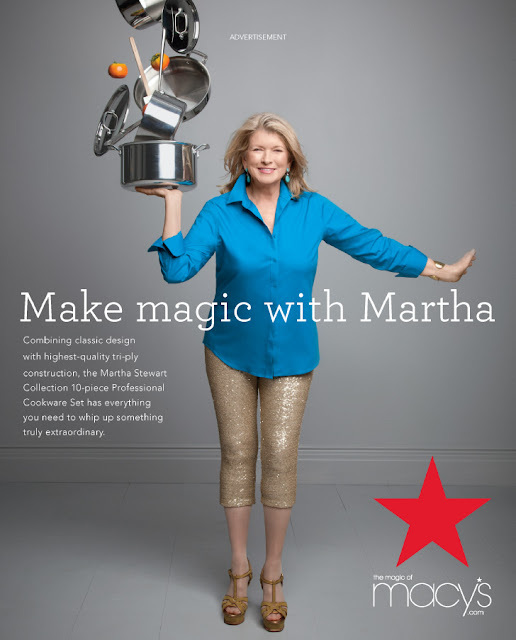 A Martha Moments reader, Trellis Smith, sent me this terrific Macy's ad featuring Martha. I was so impressed by Martha's magic (and her legs) that I decided to let you in on some of the things I'll be looking for at Macy's this Friday. My favourite class of merchandise from the Martha Stewart Collection is the kitchenware. I love the styles and varieties available - and I especially love the use of colour. My preference in the kitchen is for neutral and light colours with pattern kept to a bare minimum. What the Martha Stewart Collection has always done is to use colour in bold but small doses, which lends to the modern impact of the design. 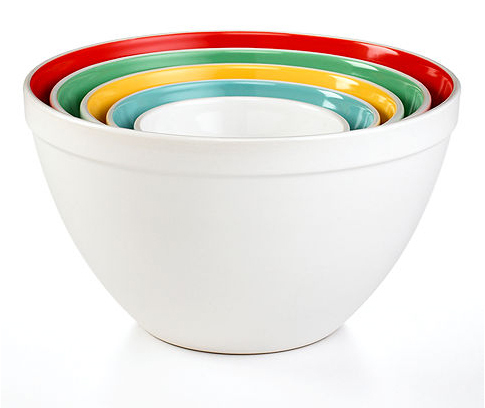 I love this set of five ceramic mixing bowls that are white on the exteriors and painted beautiful shades of primary colours on the interiors. 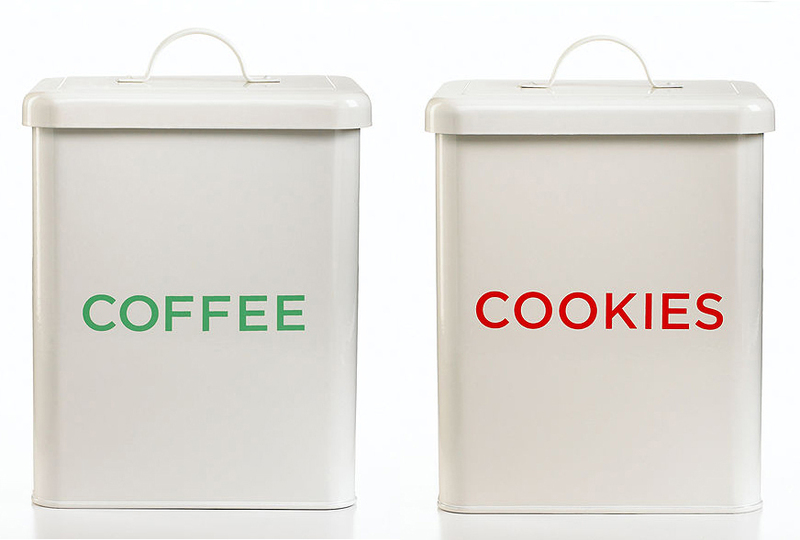 The nesting design helps with efficient storage. 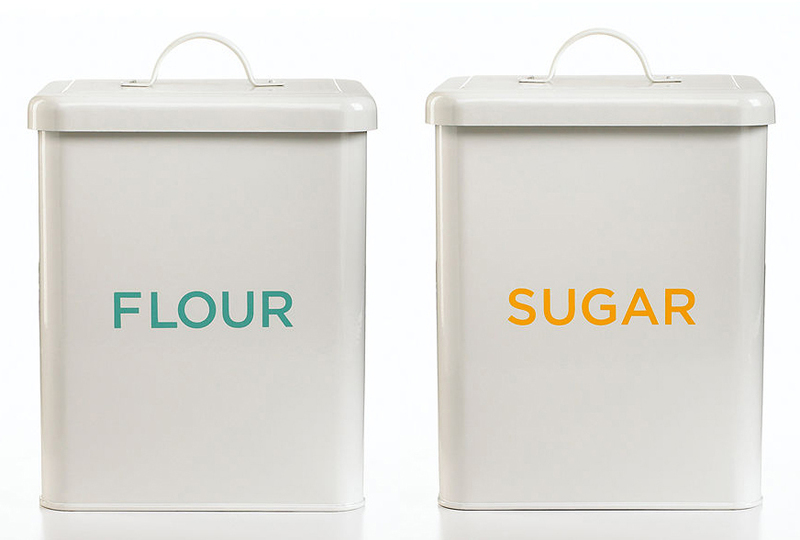 I love, love, love these food storage containers that are based on a vintage design. 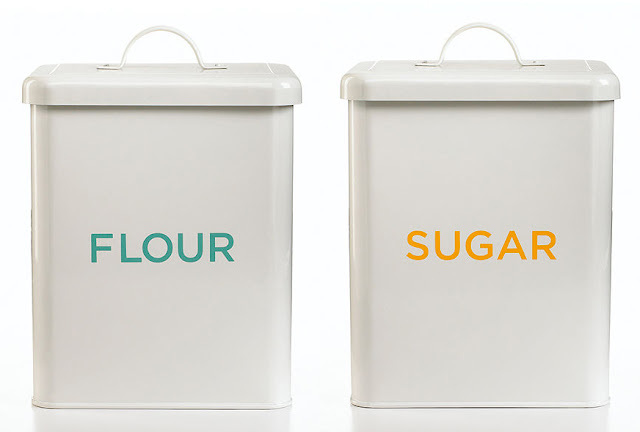 Each tin canister holds up to 16 cups of ingredients. This 9-piece cutlery set has all the essentials a chef needs to slice and dice. 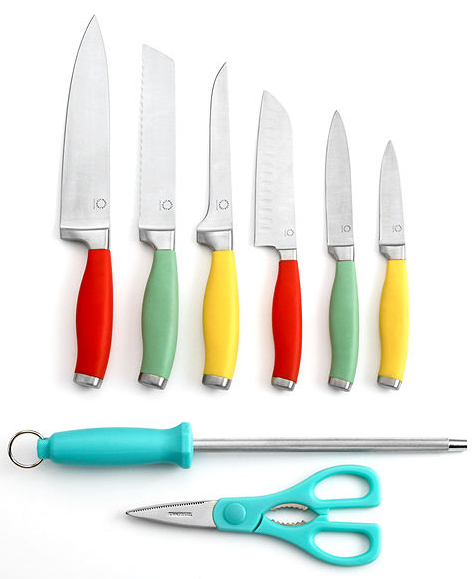 Each tool has a soft, ergonomically-designed handle in retro shades and a precision blade. The honing steel and kitchen shears are nice additions. 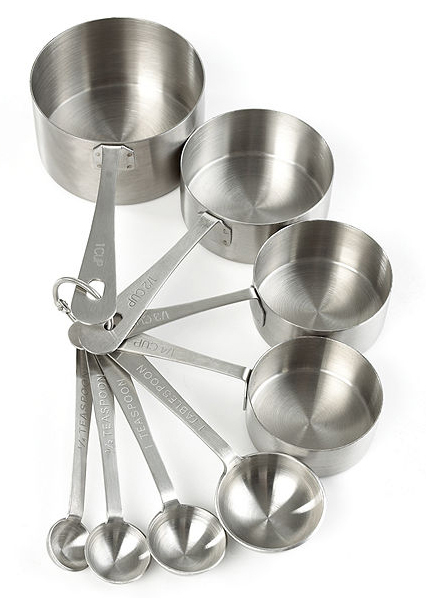 I like the idea of keeping all your measuring cups and spoons together on a single ring when you store them. These ones are stainless steel with extra-long handles for reaching into canisters and jars. When you use them, you can remove them from the ring and get to work. That's great Andrew. I was going to actually ask your assessment of Martha's Macy's products, in light of your recent Martha by Mail post. I adored that catalog and I don't feel like the Macy stuff is up to snuff. Of course I say this never having purchased a M by M item. It just all looked so lovely and I wanted it all. Looking forward to your assessment. Anonymous, the Martha By Mail products really had an air of exclusivity about them because they were not mass produced. They were designed and sold by Martha Stewart Living and manufactured by firms in England and the United States. Very few items were made in China. As such, they were quite expensive, but they had a certain cachet. The Martha Stewart merchandise that is mass produced today is mostly made in China and is sold in thousands of stores around North America, and beyond. I think the quality is very good at Macy's. It's good value. I've never had a problem with any Martha Stewart item I've purchased at Macy's and I've always admired the design and the quality. It's not as high-end as Martha By Mail, but that's to be expected with mass production. I got the Martha Stewart Professional triply Cookware... I have to say, getting it at a discount was great, $500 originally- on sale for $299, and 25% off on top of that with Macy's friends+family discount in December. The best part is- this pretty much measures up to All-Clad quality, martha girl you done good. Thanks for the tip, Alan. Unfortunately, we're only there for a few hours so Walden Galleria it is. But I plan to go again sometime to really explore. And I'm very curious about the Professional line of cookware. It looks superb.